The bird was barely warm when we stripped it. After the Thanksgiving feast, we quickly removed the turkey meat to cool and refrigerate it and placed the carcass in a deep stockpot. After being covered with cold water brought to a near boil, the turkey simmered all night nestled in with the trimmings of onions, carrots and celery, heat adjusted to a low simmer. The result was a large pot of delicious stock. This is not like the stock of last weekend, made from fresh turkey legs and necks browned in the oven and similarly simmered all night with aromatic vegetables. That produced a gelatinous, deeply flavored stock that we used to moisten cornbread stuffing and to make deeply colored gravy. No, this one is light, not gelatinous, since the bones were already cooked. 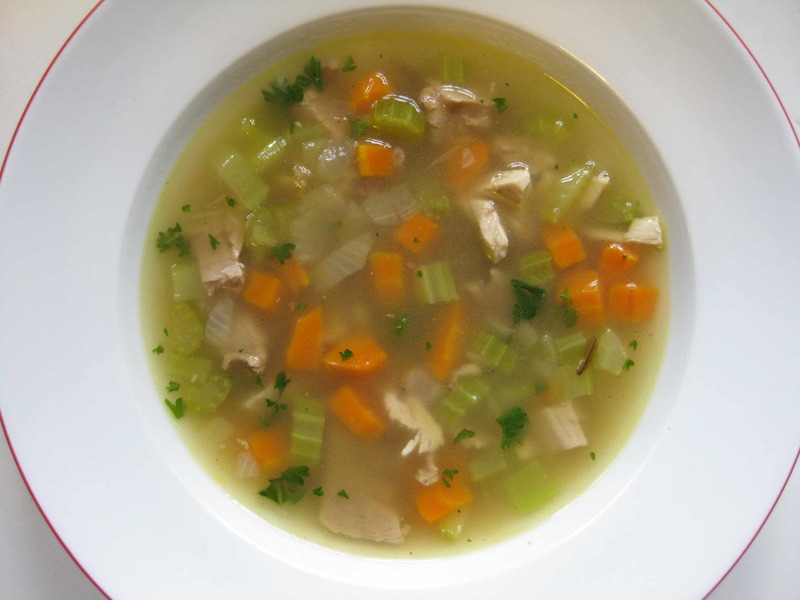 This is more like chicken stock and hence more versatile. I simply sautéed chopped onions, carrots and celery in a little butter, added stock to cook them thoroughly, and then chopped turkey meat and a combination of pre-cooked white, red and wild rice. If you don’t have pre-cooked rice, add a small amount of raw rice to the stock after bringing it to a boil. Turn down the heat and simmer, covered, until the rice is cooked. Then add more stock if necessary, seasonings and the turkey. It’s important to add the turkey at the end so that it doesn’t dry out. Bon appetit.